My September Mosaic, for the fabulous Lilys Quilts Fresh Sewing Day. I should do mosaics more often, they really make me feel like I've been super busy! So, that was September. Two swaps finished, and 3 lots of bee blocks. Not bad considering the man came home end of August and my sewing and blogging usually gets turned upside down as my routines all get changed. Well, I say "routines"... quite the wrong word really as one of my most annoying traits is utter unreliability... And I say "turned upside down" but really it's just a shift of priorities. When man is away I use whatever awake time I get to do fun stuff with fabric. When man is home I use most of the available awake time to do stuff with food (ie cook) and not such fun stuff with fabric (ie laundry). So, I'm rather chuffed with my mosaic. What I'm not so impressed with, is my spectacular fail when it comes to Rhonda's Finish Along... From my 3rd Quarter Pledge I have to come clean and admit to ... well, no finishes there at all. D'oh! 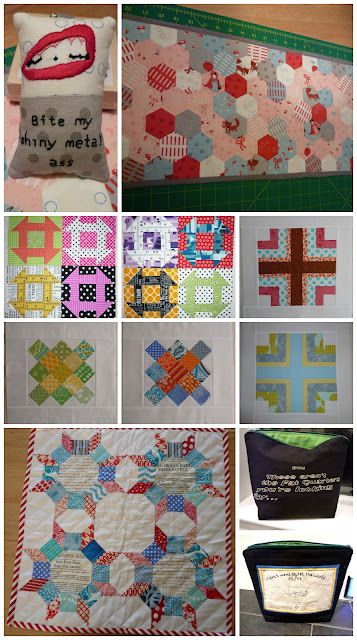 If you have the time, do go have a nosey at the other Fresh Sewing Day posts, the 3rd quarter reviews at Rhondas, and for some diverse not necessarily quilty blogs, be sure and check out the other Blogtoberfest writers! Great mosaic - packed full of beauties! i love the churn dash blocks and that pincushion is so sassy! You're funny doll! Visiting from Lily's Quilts. If in doubt, always blame 'the man'! What a great mosaic! I love your EPP mini - and that binding is fantastic! Gotta,love a man to turn your world upside down! And despite that, wow look at all that loveliness, a wee escape off the island and a swap mama to boot! 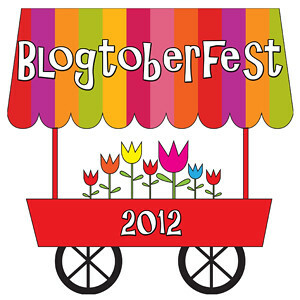 oh hell, im jumping into blogtoberfest too! ;) and i am am with you, i hope i just do half as well as i did last year! I don't even know what blogtoberfest is and I love your mosaic. I only got one FAL project done, and only finished on the last day. I too will be trying to do better next time. 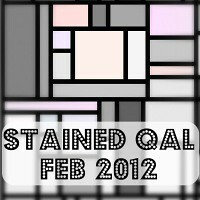 Yay to beautiful mosaics!!! And to still sewing while the man is home. Hey Sarah, so excited that you're joining is for Blogtoberfest12! As much or as little as you do is totally valid and appreciated. The mosaic is a wonderful idea. I've never out one together: is it tricky? Do you use Photoshop or somesuch? Time and time again you crack me up. You have fab finishes for Sept so ignore the lack of finishes for Rhona. Just re-post your 3rd FAL list as your 4th! Don't forget you had all the charm swap preparation/organization! Think you can give yourself a pat on the body part of your choice. Gotta love a good multiple bird massacring with one boulder :oD Love what you did get done, and good luck on your blogging mission! I sure miss our chats cuz you are such a riot and I am a mess!! !